A game of espionage, deception, and paranoia. 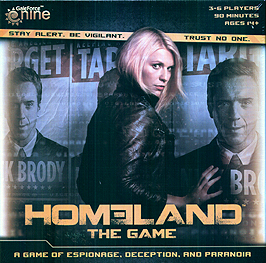 Homeland is a semi-cooperative game of intrigue, deception and hidden agendas. Play as a CIA analyst, working to combat the rising tide of global terrorism. Stay Alert: New terrorist threats are constant. Every card played matters. Any action could be the difference between stability and catastrophe. Be Vigilant: You'll have to use every tool at your disposal to stop impending terrorist threats. Deploy Special Forces, insert field agents and recruit key assets to neutralise the imminent dangers and keep the nation safe. Trust No One: Not everyone is what they seem. All players are working toward their own agendas. Watch your rivals' actions carefully to try to decipher who is working against you: any player might be a terrorist mole! Will your actions tip the balance towards national stability or global chaos?